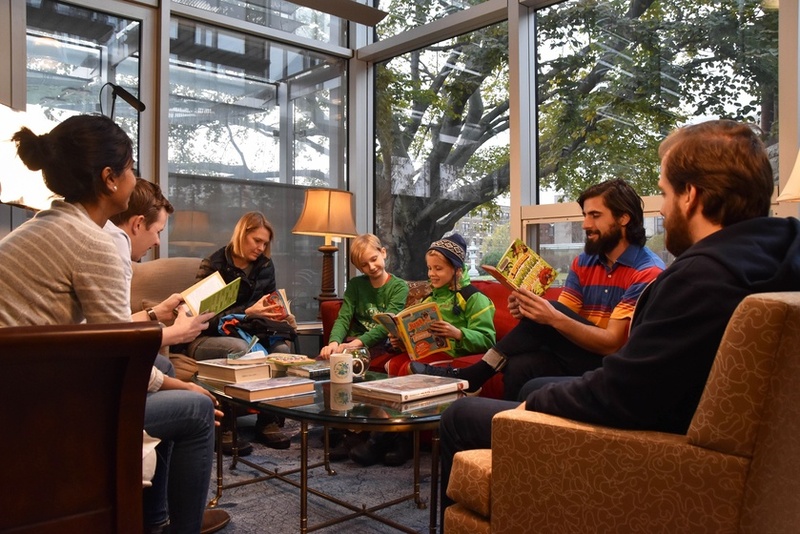 Quinn G. Perini Cambridge residents try out The Laughing Room in the lobby of the Cambridge Public Library. It’s an hour before closing time on a Sunday but the line for the Laughing Room still extends past the door and wraps around the lobby of the Cambridge Public Library. The space is an interactive art installation powered by artificial intelligence, and it’s connected to an algorithm that plays a laugh track whenever the room finds visitors’ jokes funny. The Laughing Room has clear criteria for a good joke: it uses an algorithm based on a dataset of stand-up comedy. A laptop with the machine’s algorithm displays, in code, the sentences the machine understands and the percentage of humor awarded to each sentence. More than 50 percent “funniness” on the meter solicits varying intensities of laughter. If the room truly loves your sense of humor, you are rewarded with applause on top of a thunderous roar. The installation space resembles a living room sitcom set — there are lamps, flowers, and red and beige couches situated around a coffee table of joke books. It is cozy, brightly lit, and abuzz with visitors (the room has not been empty for one minute of its three-day run). On the other side of the room, production lights and cameras face the set. The Control Room in the MIT Hayden Library plays a live stream of the footage. Jonny F. Sun, humorist and author, created the Laughing Room. Sun published the book “everyone’s a aliebn when ur a aliebn too” in 2017, born of his own Twitter jokes, which quickly gained a massive following. The Laughing Room also derives from Sun’s love of theater, stand-up, and TV. “I got really into the idea of the laugh track because it’s a strange thing that is so artificial in a way, but also suggests a realness,” Sun says. To complete the project, Sun collaborated with Hannah E. Davis, a machine learning artist and researcher. Davis’s other projects include translating books into music based on emotion and creating an AI-generated symphony, which played at the Louvre. For the Laughing Room, Davis says they considered using other technological methods, but settled on using the transcripts of comedians to train their machine in timing, syllables, and repetition. Nikhil K. Dharmaraj, a high school senior from California who worked on the project with Davis and Sun over the summer, explains the algorithm as a neural network capable of analyzing “syntactical structures of a sentence. It has been trained on a huge corpus of late night stand up specials,” he says. “It classifies every sentence into either set up or punchline.” If the room deems the punchline worthy, a laugh track ensues. Though Sun’s creation centers around laughter, he does not think the social role of artificial intelligence should be viewed entirely in a positive light. “I think the flip side of the fun, positive environment is… The terrible things [AI] is actually doing — which is mining data, collecting your information, surveilling you 24/7,” Sun says. Beyond the public library’s connection to Harvard metaLAB, the location was perfect: the library is accessible to everyone. “There’s something very public about libraries that is different from galleries and more closed off institutions,” Sun says. Reinhard Engels, the Manager of Innovation and Technology at the Cambridge Public Library, says this is the first art exhibit the library has ever hosted. He adds the installation formed a much more fascinating way of bringing to attention the issue of AI than the tech Ted talks he originally had in mind. It’s “how we as a library can fit into this intellectual ecosphere,” he says. After this three-day run, the Laughing Room will return to Cambridge and MIT in May 2019. “We have a lot of visions for this,” Davis says. The team looks forward to bringing it to more people and locations, and integrating more features into future algorithms. The Laughing Room has a very specific personality. It is capricious and difficult to impress, but it can also be very generous at times. When I walked into my room, I brought with me some of my crudest jokes, which garnered no laughs. I realized that the Laughing Room is a thoroughly wholesome character. Dharmaraj says the the machine blacklists words that some might deem offensive or politically incorrect. The laugh track playing by itself in the middle of someone’s sentence is humorous in and of itself. The cold lack of response is its own joke, as in sitcoms. The Laughing Room’s silence, in its nonchalance, seems less like an inaccuracy in detection than a personality come to life.